A spokesman for Islam4UK told the BBC it was an "ideological and political organisation", and not a violent one. Mr Johnson said: "I have today laid an order which will proscribe al-Muhajiroun, Islam4UK, and a number of the other names the organisation goes by. "It is already proscribed under two other names - al-Ghurabaa and The Saved Sect. "Proscription is a tough but necessary power to tackle terrorism and is not a course we take lightly. "We are clear that an organisation should not be able to circumvent proscription by simply changing its name." Under the Terrorism Act 2000, a group can be banned if it "commits or participates in acts of terrorism, prepares for, promotes or encourages terrorism or is otherwise concerned in terrorism". Groups can also be outlawed if they "unlawfully glorify the commission or preparation of acts of terrorism". 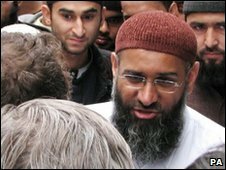 Islam4UK spokesman Anjem Choudary told BBC Radio 4: "What the people will see is if you don't agree with the government and you want to expose their foreign policy, then freedom quickly dissipates and turns into dictatorship." He denied Islam4UK members were involved in violence: "I challenge anyone to authentically prove that any of our members have been involved in any violent activities or promoting violent activities or asking anyone to carry out any sort of military operations. "We are always at pains to stress that we are an ideological and political organisation. 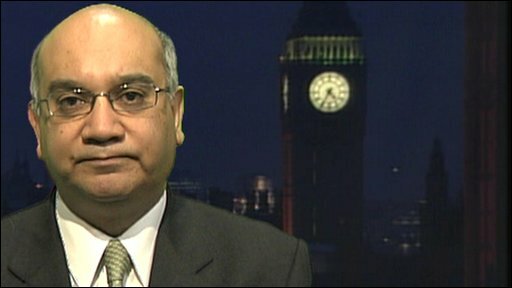 Keith Vaz MP, Home Affairs Select Committee: ""They have the right to appeal"
"We won't be using those names and those platforms which have been proscribed, but I can't stop being a Muslim, I can't stop propagating Islam, I can't stop praying, I can't stop calling for the Sharia. "That's something I must do, and ultimately I will pay whatever price I need to for my belief." Speaking from Lebanon, Omar Bakri Muhammad, founder of al-Muhajiroun, told the BBC the decision to ban the group would "increase the popularity of al-Muhajiroun" and "force them underground". On Sunday Islam4UK cancelled the march, saying it had "successfully highlighted the plight of Muslims in Afghanistan". Ordinary Muslim organisations have long regarded al-Muhajiroun as harming community relations - but they were split on whether or not a ban would be beneficial. Inayat Bunglawala of the Muslim Council of Britain, said that he would shed no tears - but he feared a ban would play into al-Muhajiroun's hands who would present themselves as the victims. "We support the ban on the extremist groups but suggest banning extremist individuals too as they will appear again with a different name," said spokesman Shahid Mursaleen. "The Government must promote a voice of moderation in order to get rid of the extremist tendencies in our society." He said: "We cannot permit any group which propagates the views of banned international preachers of hate and organises hate-filled public protests to operate in Britain. "Now ministers need to look at how they are going to ban other groups in the UK which are part of broader international networks of extremism.